Keep the message "You are a magical unicorn pony" with you all day. Wouldn't it be wonderful to wake up every day knowing you are magical? Such is life for a unicorn—and now, you. 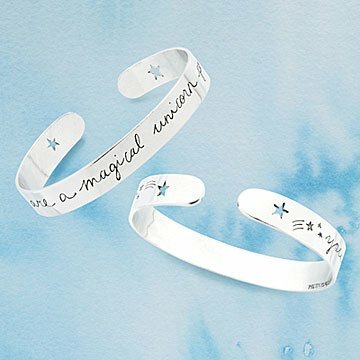 Just wrap Ana Talukder's sterling silver cuff around your wrist and the smile-inducing message "You are a magical unicorn pony" will stay with you all day. Ana hand-writes it in script and finishes each design with whimsical star details on each end. She hopes wearing this piece will remind you to enjoy the magic of life—and that we all have a fantastic beast inside of us just waiting to sparkle. Handmade in Seattle. Take a Studio Tour to see Ana's inspiration behind this cuff! Polish with anti tarnish cloth.